Beyond the Virus ist die englische Ausgabe des Buches Endlich mal was Positives, aktualisiert und für internationales Publikum adaptiert. 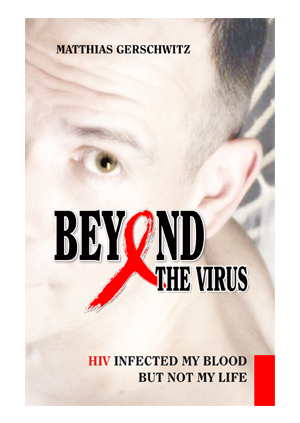 Beyond the Virus – HIV infected my blood but not my life, offers an intimate view into the life of a positive man. Matthias Gerschwitz, author and protagonist, is HIV positive. The virus was detected in 1994, but likely transmitted in 1992. The author is one of more than 80,000 persons living with HIV or AIDS in Germany (as of October 2015) and one of the only a few to go public with his infection. The tone of the book corresponds with his personal way to handle his infected life: pro-actively, openly and with optimism. Beyond The Virus is about a life with HIV, now spanning over more than twenty years. The author never bemoaned his diagnosis. Instead he accepted the infection rather quickly and proceeded to deal with his altered life with optimism and a positive attitude. The book covers the author’s personal circumstances, experiences and insights. Some general information also found its way into Beyond the Virus, thus connecting the personal insight with interesting and relevant knowledge on how HIV is viewed in Germany today. Get more information at beyond-the-virus.com.